93 associated with harm to aquatic life. California’s fracking disclosure law is the most comprehensive in the nation. The data in the reports submitted to the state’s oil and gas regulatory agency provide the most detailed accounting available of the chemical makeup of fracking fluids, at least for one state. Fracking fluid is a mix of water, chemicals and sand that is pumped into underground shale rock formations under great pressure to free up trapped oil and gas. After a well is “treated” in this way, some of the fluid flows back to the surface, usually picking up additional chemicals that occur naturally in the shale. In California, most of the wastewater is disposed of in underground injection wells or in unlined pits, some of them dangerously close to potential sources of drinking or agricultural water. An earlier EWG analysis found that fracking wastewater contains numerous hazardous substances, some at levels much higher than state drinking water regulations allow (EWG 2015). Nationwide, a recent U.S. Environmental Protection Agency report found nearly 700 fracking chemicals in use (EPA 2015a). But EPA relied on data from FracFocus. org, an industry-funded voluntary database that – unlike the California law – allows companies withhold information they consider trade secrets. FracFocus.org has repeatedly come under criticism for inaccuracies and lack of transparency (Hass et al 2012). Comparing the state and EPA data shows that some of the most hazardous chemicals are used less often in California than nationwide, but the typical California job uses about twice as many distinct chemicals as the national average.2 And because fracking in California tends to use less water than in other states, the concentrations of chemicals in fracking fluids are sometimes higher (CCST 2015). 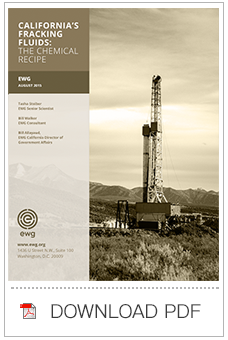 The new EWG analysis looks at what goes into the fracking fluid before it’s pumped into a well, revealing the likely origin of some contaminants in the wastewater and also the array of hazardous chemicals used, stored or transported at fracking sites. These chemicals have the potential to contaminate drinking water, air and soil, as well as to endanger the health of oilfield workers and people who live or work nearby. It is an industrial process that from beginning to end is a source of potential exposure to chemicals that are hazardous for people and the environment. support recommendations for groundwater monitoring in oil and gas areas and properly enforce the model criteria developed under the disclosure law. 1 The 197 chemicals were compared to an EWG database drawn from 15 sources, including government agencies, industry panels and aca- demic institutions and Material Safety Data Sheets required by federal regulations. The tables in the Appendix provide the unique Chemical Abstracts Service Registry number for each chemical, which can be used to look up the safety data sheet. 2 It is unclear whether California fracking jobs actually use more unique chemicals or if the difference is because California’s disclosure law is more comprehensive.